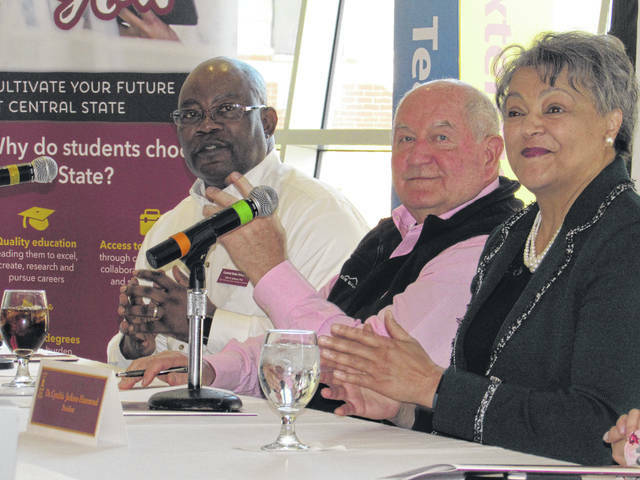 Central State University Dean Alton B. Johnson, at left, U.S. Agriculture Secretary Sonny Purdue, center, and Central State President Dr. Cynthia Jackson-Hammond talk with agriculture students during a panel discussion on agriculture Thursday at the university. U.S. Ag Secretary Sonny Perdue talks with staff and students at Central State University Thursday, April 5 during his visit to Ohio. WILBERFORCE — U.S. Secretary of Agriculture Sonny Perdue visited Greene County, April 5 and fielded questions from agriculture students, including some on the hot topic of the U.S. trade war with China. “The president has told me personally that he’s not going to allow farmers to bear the brunt and to be the victims of trade disputes here,” Perdue said, referring to recent tariffs China put on steel and aluminum, and the issue of China stealing U.S. intellectual property, including agricultural property. Perdue visited with students and faculty of Central State Universityduring his “Back to Our Roots” RV Tour. While there he went on a tour of the university’s College of Engineering, Science, Technology, and Agriculture. He also answered students’ questions during a roundtable discussion. “The future of agriculture is bright,” Perdue said as he provided answers to students inquiring about future agricultural careers, agricultural policies, women in agriculture and the pros and cons of working in the agricultural industry. Perdue added that they should consider Ag communication and research services at the U.S. Department of Agriculture. On his “Back to Our Roots” RV Tour, Perdue also visited other locations in Ohio, as well as in Michigan and Kentucky. https://www.fairborndailyherald.com/wp-content/uploads/sites/50/2018/04/web1_Dean-Alton-Johnson-Sonny-Perdue-and-CSU-Pres.jpgCentral State University Dean Alton B. Johnson, at left, U.S. Agriculture Secretary Sonny Purdue, center, and Central State President Dr. Cynthia Jackson-Hammond talk with agriculture students during a panel discussion on agriculture Thursday at the university. Video Caption: U.S. Ag Secretary Sonny Perdue talks with staff and students at Central State University Thursday, April 5 during his visit to Ohio.